This English based club with an Irish identity needs no introduction so instead justs how where your passion lies in this London Irish 18/19 Players 1/4 Zip Rugby Jacket from X Blades. This official 1/4 zip jacket of London Irish comes in a new sublimated printed design of navy with green detailing across the front and back. As worn by the Professional Players on a daily basis and features the brand new club badge printed upon the chest to prove to all the doubters where your loyalty lies. Made from 100% polyester material, X Blades XPF mesh moisture management technology helps keep the wearer feeling cooler, drier and more refreshed when in action by drawing sweat away from the skin and quickly drying off. * A bonded soft shell material with a fleece lining and water repellent coating helps keep you warm & dry in poor conditions. * This ground breaking fabric makes this training top comfortable to wear. 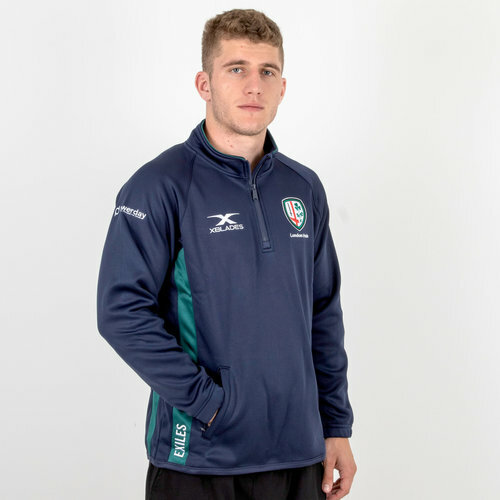 Stay warm when you work out and fine-tune your skills on the practice pitch without ever compromising your support for London Irish with this 2018/19 Players 1/4 Zip Rugby Jacket.